Our shrub trimmers follow the unique guidelines and instructions that are delivered by our customers in the aide of the concise, quality service that we can provide to you. We build the guidelines and projected look alongside our customers so we are on the same page and nothing is done to your property without your knowledge and consent. When your dealing with Baytown Tree Care’s shrub trimming service we will always ask more questions to make our customer’s as happy as possible with the completed project. No one residential or commercial business needs and specifications are the same. We know that these are the facts of the job here at Baytown. It is a certainty that good communication between the homeowner and our specialists is the bedrock of creating the bush and shrub specifications that matches up to the homeowners liking. In speaking with one of our shrub or bush managers let them know as best as you can what it is that needs to be done for your shrubs and bushes, exactly as you envision the job being done. With a clear channel of communication we at Baytown Tree Care ensure the customer’s overall satisfaction and in doing so we continue to build our reputation as great professionals in the field of trimming and upkeep for shrubs and bushes. However, specific or unique your shrub removal or trimming needs we will never be surprised. At least we wont be surprised easily. Our employees know and understand what skill and attention to detail our customers expect. 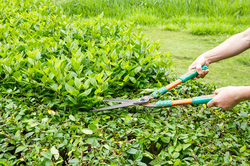 After the trimming and upkeep of your shrubs you can fill out one of our customer service surveys that relays the pertinent information to us at Baytown Tree Care so we can maintain a controlled quality of service that will deliver the good each and every time your shrubs and bushes need check up and trim. Our customers know that we can create a plan for your topiaries and their comprehensive look, in doing so we take the necessary to make our customers feel secure and confident in the fact that they are paying for the best tree service available on the market in all of Texas. Not only do we do service on shrubs and bushes, we can also add artistic flourishes and touches to your hedgerows that will make all of your neighbors jealous of your home’s new decorative splash of style. Call (281) 975-0077 to trim those annoying shrubs!